Goods & Services Tenders: How to Change Digital Signing Certificate (DSC) of a User? Goods & Services Tenders: How to Reset Password using Digital Signing Certificate (DSC)? Goods & Services Tenders: How to View Letter of Acceptance? Vendors/Bidders can see the letter of acceptance after login to their account on IREPS portal. Firms who have been issued Letters of Acceptance (LOA) can view the same through this icon in the folder My Post Tender Activities – Letters of Acceptance. Goods & Services Tenders: How to View Counter Offer and Reply to Counter Offer? Firms who have been issued counter offers can view the counter offer letter through this icon in the folder My Post Tender Activities – Counter Offers. Clicking on this icon brings up the interface for submission of response against a counter offer issued by the tendering department. This link is available in the My Post Tender Activities- Counter Offers. The link is available only upto the response date stipulated by the tendering authority for submission of reply to counter offer. 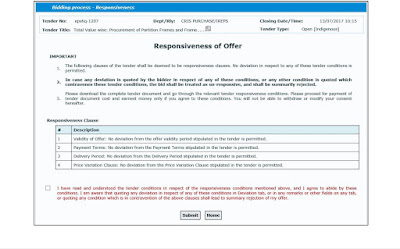 The bidder is required to choose acceptance or rejection of counter offer in the Response field. In case of rejection, it is mandatory for the bidder to give reasons for rejection of counter offer in the remarks column. Goods & Services Tenders: How to View Negotiation Letter and Submit Negotiated Bid? Firms who have been invited for negotiations can view the negotiation letter through this icon in the folder My Post Tender Activities – Negotiations. Clicking on this icon brings up the interface for submission of negotiated bids. This link is available in the My Post Tender Activities- Negotiations folder. The link is available only upto the closing date and time for submission of negotiated bids. The process for submission of negotiated bids is described below. Goods & Services Tenders: How to View Offers and Tabulations of a Tender? After the opening of the tender eligible vendors/bidders can see their offers and tabulations. Through this icon the Vendors can view the bid submitted by them against the tender. This icon is visible only after the tender has been opened. The icon is available in the My Tenders- Closed folder in the Middle Body of the Bidder Home Page. Firms who have submitted their offer against an Open Tender can view Financial Tabulation Statement auto-generated by the system immediately after opening of the tender through this link. Financial Tabulation is a comparative statement of the financial terms (rates, taxes & duties etc.) quoted by various bidders. Goods & Services Tenders: How to Submit a Revised Offer? To submit revised bid the bidder has to click on Submit Revised Bid Button in the Action column. This will again open the Bidding interface, and the bidder has to follow the steps given in below link to submit his revised bid. Bid Preparation and Submission: This icon is displayed only to those Vendors who are authorized to bid against the tender. 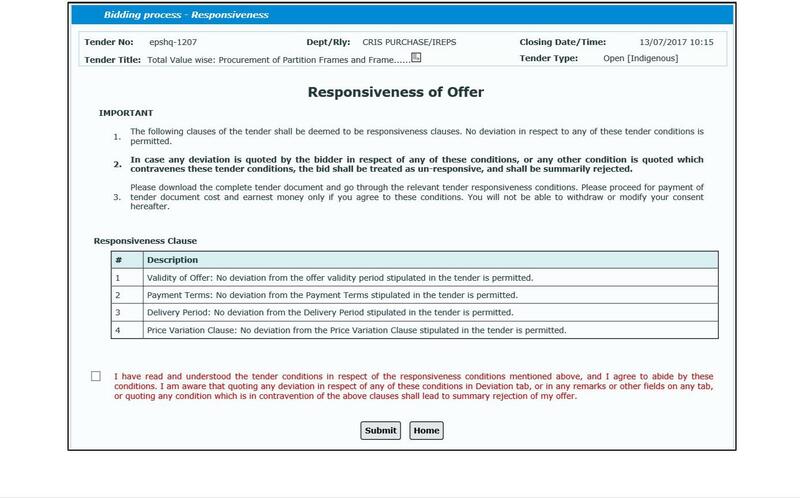 If any responsiveness clause has been added by the tendering department, clicking on the bid submission icon opens the Responsiveness page. The responsiveness page lists tender conditions in respect of which the bidder is not allowed to quote any deviation. Quoting of deviation in respect of any of these clauses shall lead to summary rejection of the offer. The bidder is required to tick the check box at the bottom of the page as a mark of acceptance of the conditions mentioned on the page. Goods & Services Tenders: How to Make the TDC & EMD Payments for a Tender? Make/View Payment - TDC & EMD: This icon is displayed in My Tenders (Live) and My Payments folders in Middle body of the Bidder Home Page and in the Search Tender page for all published tenders for all live tenders only to those Vendors who are authorized to bid against the tender. For open tender this icon is shown to all the bidders, and for Limited, Special Limited and Single tender it is available only to those firms who have been sent the tender enquiry for the tender. Clicking on this icon opens the Payments page which is the interface for making payments towards Tender Document Cost (TDC) and Earnest Money Deposit (EMD). If Tender document cost (TDC) is not yet paid, the page for payment of TDC is opened. If TDC has already been paid, payment page for payment of Earnest Money is opened. The payments already made by the bidders are listed at the bottom of the page. For Tender Document cost the entire payment has to be made in one go, whereas for Earnest Money the payment can be made in multiple installments. Goods & Services Tenders: How to View corrigendum List Issued in a Tender? A corrigendum is a change/modification/update in the tender document after publishing the tender. You may see the list of corrigenda published in a tender by clicking on the Corrigendum List icon. This icon is displayed in My Tenders (Live) and My Tenders (Closed) Folders in Middle body of the Bidder Home Page and in the Search Tender page for all published tenders, for all tender types. Clicking on this icon opens the Corrigendum page, whereby the users can view the list of all the corrigenda that have been issued after publication of the tender. Clicking on the View Corrigendum details icon in Action Column of this page opens the individual corrigendum letter. Goods & Services Tenders: What is the Significance of the Different Blocks of the Tender Document? This section contains general details related to tender like Contract Type, Closing Date & Time, Evaluation Criteria, Earnest Money, Tender Document Cost etc. Goods & Services Tenders: How to Login into IREPS Application as a Vendor? First, open the home page of IREPS application www.ireps.gov.in and click on the Login button on the Home page and choose the option E-Tender. It will open the Login page for you.